To see a collection such as this, written specifically for young people with its feminist message by contemporary authors who crossed cultural boundaries and set in exciting alternate and dystopian worlds and different realties hit all the right notes for me. The anthology includes seventeen works of fiction, including a play and six graphic stories written by twenty-two authors and illustrators and set in dystopian or fantasy worlds and sometimes in distant galaxies. Contributors were given the added challenge of working in collaboration with a partner from the other country on which they give an insight in brief notes at the back of the book. 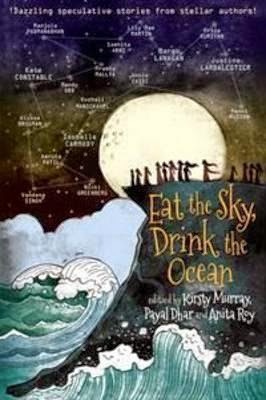 My favourite stories include ‘Cast Out’ by Samhita Arni, ‘Cat Calls’ by Margo Lanagan and ‘Memory Lace’ by Payal Dhar; I also was immersed in the graphic story by Isobelle Carmody through the illustrative style of Prabha Mallya. In 'Cast Out', girls showing signs of magic, even in self-defence, are cast off in the ocean to die a gruesome death. The main character also finds herself in this position, and what she finds will change her life as much as it has been saved. Reading the inspiration behind the story which was based on conversations between Samhita Arni and her Australian counterpart, Alyssa Brugman, on feminism and consumerism gave an insight into how this story came to be. Brugman’s story ‘Weft’ is a very different, thought-provoking story showing the main character’s reflections while she is in the process of buying a full head of hair. This is a strong contender for my favourite anthology of the year!